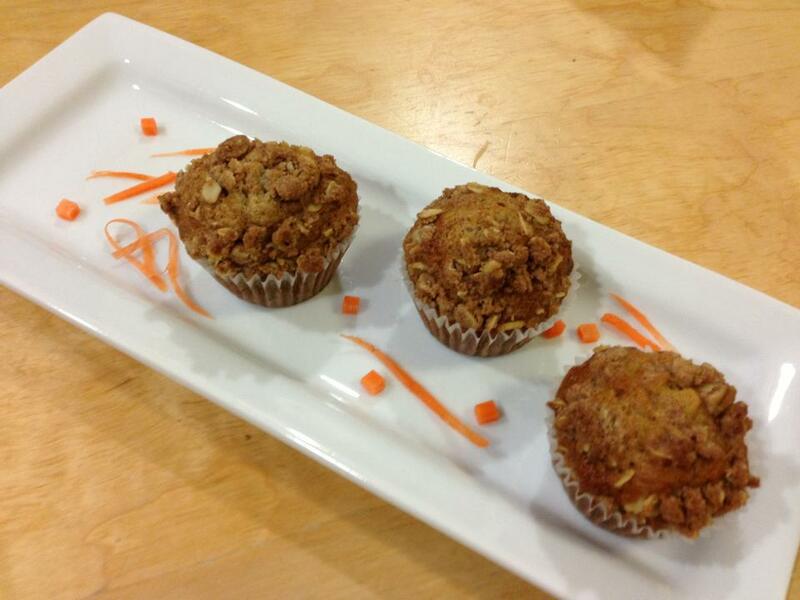 Our second week of muffins we baked the richer, denser carrot and banana muffins. 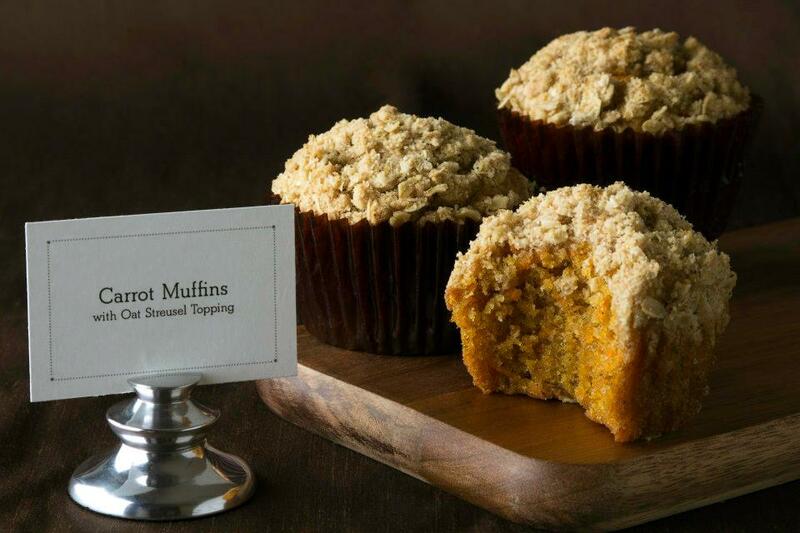 Carrot was unanimously the more popular choice and all agreed that the muffins were moist and delicious. The streusel adds great texture top the tops as well. Leticia, one of our team members decided to welcome Spring with her garden-inspired food styling. The carrots look ready for picking. I love carrot cake and had been looking forward to this carrot bake. I purchased carrots with their tops still on them and when I shredded them they had a lot of moisture. I did not have light brown sugar and used dark brown instead. This was a straight forward recipe with no lengthy process (with exception of the usual overnight refrigeration). The muffins called for the Oat Streusel Topping. The ingredients were oats, wheat germ, cinnamon, and nutmeg; an awesome combination. The muffins came out moist and dense. The streusel went perfect with the muffins. No more cream cheese topping for me. I have made three batches to date. Easy recipe. I thought to myself that most of these muffin recipes are fantastic, corn still being the surprise favorite. These can easily be made ahead of a brunch party or breakfast. So nice just to pull batter out of fridge and bake muffins. This time around, I decided to make 12 regular size muffins. The batter portion if perfect for 12 standard. I did not make the streusel topping for no other reason that I was hoping to borrow some from another baker. I ran out of time. No matter, they are great without as well. I used vegetable oil instead of canola. Not sure if that makes a difference? Comparing mine to Leticia's and Tania's excellent carrot muffins, my spice seemed a little flat. I'm sure that had everything to do with the lack of streusel. Easy muffin to make, and will make again. This week I chose to make carrot muffins. I have made many carrot cupcakes in the past, so it was a natural choice. What is the difference between a cupcake and a muffin, you may ask? It's easy. Generally, cupcakes are just little cakes, whereas muffins are more similar to breads. However, these muffins do have a fine crumb, much like a cake. All they need is a swirl of cream cheese frosting, and they could easily masquerade as a cupcake. I used 3 small carrots, hand-grated. I used ginger instead of nutmeg, because I didn't have nutmeg because I don't like nutmeg. Ginger pairs well with carrot, so I was confident in the substitution. This time, I did make the batter the day before and let it chill overnight. I also made the oat streusel topping ahead of time so it could chill properly. I scooped the batter into the prepared muffin tin, getting 6 big beautiful muffins. When adding the topping, I felt it may have been too much (3 tbsp), but after baking, it ended up being fine. The streusel cracked as the muffins rose, some in a nicer pattern than others. Again, these are great, easy muffins to make, nice to have the batter ready the night before you plan to bake it. So I couldn't help myself and decided to make banana muffins also! I just so happened to have some bananas in the freezer, so I didn't have to buy anything special for the recipe. This recipe also calls for cake flour, like the lemon poppy seed muffins I made last week, so I knew it would result in a fine crumb and a tender muffin. Unlike the carrot muffins, these used butter and creme fraiche for added moisture and flavor. I defrosted my frozen bananas overnight in the fridge. The skins were black, but I knew the fruit inside was good. However, when they were defrosted, they were extremely mushy. I couldn't even peel them. I cut off the stems and simply squeezed the mushy banana into the bowl. I didn't even have to mash them! I would recommend freezing bananas for any recipe that calls for mashed bananas, it's super easy! These are really good! The tip about refrigerating the batter overnight developed a very flavorful muffin. I made a batch with a mini muffin pan and got 29 muffins out of one batch. The only modifications I made to the recipe was cutting back the sugar to only 1 cup, replacing the canola oil with a light olive oil and adding 1/2 cup of dried raisins to the batter before refrigerating overnight. They baked up well and stayed so moist, better than any carrot cake we've had. After baking several other muffins in the book, this recipe was rather simple to follow. My only debate was how to shred the carrots. The book doesn't offer suggestions on how large the pieces of carrot should be, so I opted to use my food processor for efficiency. The result was a perfect, large enough to see but small to cook through when baked. For this recipe I chose Saigon cinnamon for its warmth. The muffins were moist and fragrant with a nice crumb and the perfectly paired oat streusel topping enhanced each bite. I will definitely visit this recipe again, perhaps adding raisins as suggested by another baker. For those that have made the carrot muffins, what method did you use to grate the carrots? Box grater? Microplane? When I think of grating, I think of the really sharp knobby side of a box grater. I looked at the recipe a while back and I don't recall any description about it. I used the smaller holes on a box grater. You can also use a food processor, which is a lot faster. Our bakers used both methods with different results. It all depends if you want a muffin that is more rustic or refined. Does anybody who have baked the banana muffins find them a little bit too salty? I used 4g of table salt, which amounted to about 1 tsp, instead of 4g of kosher salt. Other than that, I followed the recipe to a T. Some family members think the muffins were very good but too salty. Thanks. Regarding the salt, table salt is usually way too salty for baking. Kosher salt or fine sea salt is preferred. I know it seems silly to buy two different kinds of salt, but I use Kosher salt for everything now. Or, you can decrease the amount of table salt you use by half and that should work.